The Welsh settlement of the Cape Fear region in the early eighteenth century extended 80 to 90 miles inland along the creeks flowing into the Cape Fear and the Northeast Cape Fear Rivers. 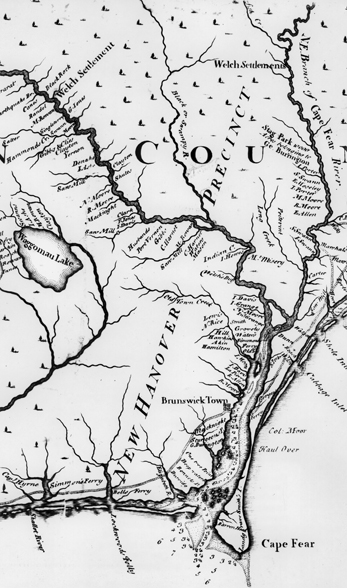 These bodies of water included Rockfish, James's, Swift's, and Smith's Creeks, Black Mingo and Goshen Swamps, and the Black River near Elizabethtown. This region today covers parts of the counties of Bladen, Columbus, Duplin, Onslow, Jones, Brunswick, and Sampson. The Welsh settlement was spread out because of the naval stores industry; when the British Parliament granted a bounty on naval stores in North Carolina, this encouraged Welsh settlers to migrate from Pennsylvania (later New Castle County, Del.) to the colony in the 1720s. The Welsh settlement in North Carolina preceded the Welsh settlement that began in South Carolina in 1736 on the upper Pee Dee River near the present town of Society Hill. Welsh settlers in North Carolina were primarily Presbyterians of a strongly Calvinist bent who had attended the Pencader Hundred Presbyterian Church in Pennsylvania. They, along with immigrants from Scotland and Ireland, organized the colony's first Presbyterian congregations in the 1730s and 1740s, and the churches they established had a strong cultural influence in the region. Rock Fish and Hopewell Presbyterian Churches in Duplin County are examples of churches begun by Welsh settlers in the eighteenth century, and their graveyards have tombstones bearing Welsh surnames such as Morgan, Edwards, Thomas, Evans, James, Jones, Williams, and Wells. These surnames are very prominent in the modern Cape Fear. Edward George Hartman, Americans from Wales (1983). George Lloyd Johnson Jr., The Frontier in the Colonial South: South Carolina Backcountry, 1736-1800 (1997). Hugh Meredith, An Account of the Cape Fear Country, 1731 (1922). Lloyd Johnson, “The Welsh in the Carolinas in the Eighteenth Century,” North American Journal of Welsh Studies, Vol. 4, no. 1 (Winter 2004), 12-19. Welsh Tract, NC Historical Marker D-34, NC Office of Archives & History. http://www.ncmarkers.com/Markers.aspx?MarkerId=D-34 (accessed February 23, 2015). The Welch settlements ENC also includes Parts of present day Northern Pender Co (formally part of New Hanover Co) . A large track was settled from Rockfish Creek on the Duplin Co line running south to where Riverview Cemetery is today. The Jones and Wells names still heavily populate this area.